I’ve driven the Tesla Model 3 sedan, the Jaguar I-PACE compact crossover, and the Tesla Model X three-row SUV. This is going to be a slightly unusual comparison, but it isn’t my fault. As I’ve noted before, Tesla has a segmentation problem. Here at Business Insider, when we want to match up compact crossover SUVs, we can find two similar vehicles from different brands. But when it comes to all-electric cars, it’s a different story. The Tesla Model 3, for example, could take on the Chevy Bolt — and I have compared the vehicles. But the Bolt is currently the only true long-range EV on the market that sells for under $40,000. Tesla isn’t yet making the $35,000 version of the Model 3, so you have to point out that the available Model 3 is a premium/luxury car, while the Bolt is a mass-market offering. A larger issue is that because Tesla is only selling three vehicles and has to tweak them in various ways — amenities, self-driving system, total range — to serve buyers at different economic levels, it’s challenging to manage good direct comparisons with anybody else’s cars. The Jaguar I-PACE is a case in point. We sampled it last year. The Tesla vehicle it should match up against is the forthcoming Model Y crossover, but the Model Y isn’t yet being produced. Still, the I-PACE is on sale, so if you’re shopping electric, chances are you’ll give it a look. So here’s the idea: I’ll compare the Jag against the Model 3, which is cheaper, and the Model X, which is pricier. I know which vehicle I like best, but I’ll try to set it up so you can make the best choice for your needs. 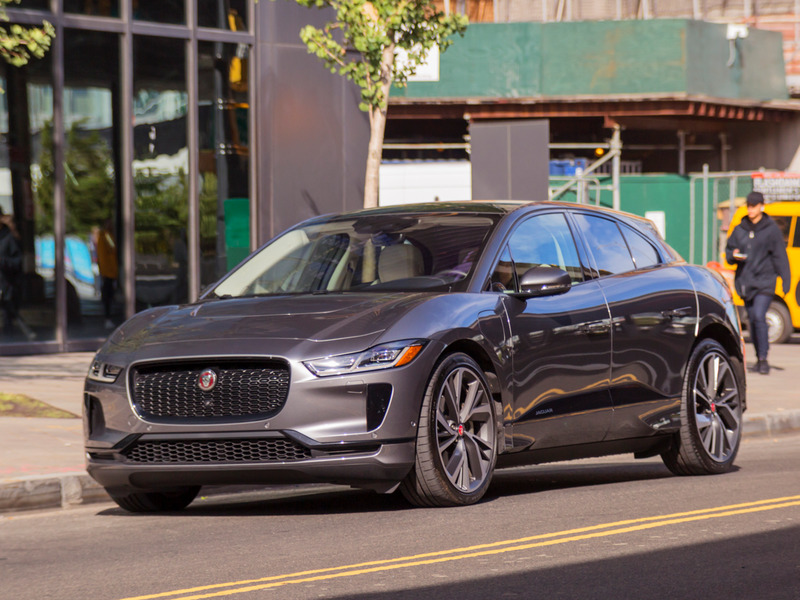 First up, the 2019 Jaguar I-PACE EV400 HSE in „Corris Gray.“ The 2019 Jaguar I-PACE starts at $69,500 while the top-spec HSE variant starts at $80,500. With options and fees, our test car came to $86,720. Jaguars are supposed to be beautiful cars. The I-PACE looks nice. But beautiful? Not in my book. However, it is poised, powerful, and sleek. „The I-PACE utilizes a design principle called cab forward, which pushes the cabin towards the front of the car while moving the wheels to the far corners,“ Ben Zhang pointed out when he reviewed the vehicle. The leaping car is front and center.